It was dusk, and all was peacefully quieting down in the park until, “Clonk, clonk!” It sounded as though a clumsy big horse was having trouble getting back into its stall, knocking things over along the way. . . . except that there are no horses or horse stables in San Francisco and haven’t been for decades, by law. This un-“natural” sound probably sounded all the more disparate because I was out in nature. Instead it was a young Barn Owl (Tyto Alba) waking up after a long days nap — banging against the sides of its own “barn” — a man-made owl box. A few minutes later I heard loud wing battings. How could this be? Aren’t owls supposed to be silent flyers so as not to be heard by their prey? And then I heard what sounded like the complaints/warning cries of alarm of a bird such as a Stellar Jay — maybe a little different — and I figured some bird was warning-off these predator owls from encroachment. Wrong again. THAT was the sound of the Barn Owl itself! Barn owls don’t who, who, whoot, they screech in a bunch of different ways! https://yipps.files.wordpress.com/2016/07/2016-07-15-barn-owls.mp3 AUDIO: Notice there are a couple of distant coyote barks at the 34-39 second marker, and the owls get really intense at the 2:54 marker. The recording lasts 3:24 minutes. As I sat there listening to their amazing shrieks, screeches, peeps, hissing and squawks, I saw one, and then THREE others — a total of four — fly off to a nearby tree — wow, there were that many here?! This was indeed a surprising night. For years I’d seen one at a time at dawn and dusk, gliding and swooping in its silveriness, ever so silently through the dark. You could only see them as you do the bats — against the lighter night sky before total darkness set in. Once, I lay down on the ground and was able to capture, in a photo, an owl as it “mothed” right above me, from what seemed like five feet away, examining me out of curiosity — no, it was not courting me! It was only because that owl was against the lighter sky that the camera was able to capture its image — it was actually dark outside. Why hadn’t I seen them here before? There were actually several signs that the owls were there, including the box itself. The old owl box has been empty for many years, or inhabited by squirrels, so there had been no reason for me to suspect that the box was rightfully occupied now, but there were other signs staring me in the face. Owl guano droppings had hardened along the length of a nearby tree trunk, and below another tree there were owl pellets and what looked like white splashes of paint — more guano, or owl poop which had been expelled away from the tree trunk and lay in individual blotches. There was even a dead mouse which had been rejected. I pulled out my camera and took a few shots in the obscure nighttime lighting. I got home and processed the photos — nice photos except they were rather grainy due to the lack of light at 9:00pm. I decided that I would come back tomorrow and take photos with the aid of a flashlight, the way I had the raccoons years ago in Golden Gate Park. The next evening, a little bit earlier than before — I didn’t want to miss anything — I arrived and plopped myself some distance away and waited. Soon a little face appeared in the hole of the box and I got a couple of shots. Then the face disappeared. The scenario repeated itself, only this time there was squawking from around me as the little feathery fella revealed himself. It was the adult owls — I thought they were chattering away. Several of the owls appeared on the branches in neighboring trees to gawk at me — like I suppose I was gawking at them. I then focused the camera over on the owls in the branches and took some more pictures. The little fella in the box re-appeared in the opening. Suddenly the urgency in their shrieks intensified. And it is then that the tone of those intense squawks gained meaning: they were warning the little fella in the box: “keep down, keep down, danger, danger! !” All critters protect their nests and youngsters. Now a couple of the owls appeared on a nearby board/platform and right on the box itself, as those around continued their warning cries. They were distressed. And the youngster, too, looked worried, and cringed, and looked in the direction of the adults knowing that all the commotion signified danger. Now I knew that the loud batting wings I had heard the day before also had been warning messages. I did not feel good about the distress. I had the choice of returning the next day or lingering a moment longer to get a few more photos now. I decided on the latter course of action — it would be less disruptive than returning again. I grabbed a couple more shots and then left. I went home and processed the photos, looked up some tidbits of information which I’ve added below, and wrote up the encounter. I was totally distraught and upset that my presence had upset the owls which were in their nesting phase, and I vowed to never go back, and neither would I be the catalyst for others to disrupt these birds. By extension, this situation is true for all wild animals anywhere, including coyotes in our parks: they just want to be left alone and not be noticed, but if they are intruded upon or threatened — even if it is just in their own perceptions — they will come forth with display messages and screeches — and more — if they feel a need to defend themselves, their territories, and especially their young. I would write it up, but I would not reveal the nest location: the owls would not have wanted that. They are nocturnal, so if you want to see them you should begin your walk in the dark — and keep your eyes on the sky above the tree-line: you may see one floating silently by before returning to its roost at dawn, or as it begins its “day” hunting at dusk. Or, you could see them as a shimmer against the darker trees during those twilight hours. This experience of mine was so totally different from that with the famous Great Horned Owls in the Eucalyptus trees which many folks have observed, where the adult owls took the gawking of their owlets in stride. Fortunately, this little green box is in a remote part of the park, actually in someone’s yard. One of the neighbors recently told me that “those birds” were keeping him up throughout the night. It is because he told me this that I stopped to investigate that “clonk” sound. Below, I’ve written up some tidbits of information I collected over the internet. Contrast this with the Great Horned Owls who live in the same parks as the Barn Owls but who are very territorial: only one mated pair and their offspring live in the area. Their territoriality actually places a limit on the number of breeding pairs in any given area. Great Horned Owls who haven’t been able to establish territories are known as “floaters” — they live along boundaries of established territories. In fact, it may be that just the male Great Horned Owls defend the territories. They are known to kill each other in territorial conflicts, and sometimes resort to cannibalism. Nesting. I found out that most Barn Owls mate for life — they are monogamous, as are Great Horned Owls — though there have been reports that some males have had several female mates at the same time. And Barn Owls tend to use the same nest site year after year. One of their courting displays is hovering in front of the female in a “moth-like fashion” — Oh, I’ve experienced this several years ago! Chicks usually start flying at 9-10 weeks and begin leaving the nest for good at about 11-12 weeks. All will probably be gone by 14 wks. If there is nesting in July, as was the case with this find of mine, it’s usually a second clutch for the mated pair. About 10% of barn owls reproduce two times a year — and some even produce three clutches in a year! And, although the breeding season is considered from March to August — having expanded due to climate change from an original breeding season which was almost always in May — they, in fact, can produce youngsters at any time of the year. They lay as many as 6 eggs, but more often than not, only about 4 of them hatch. The eggs are laid asynchronously, every 2-3 days and they hatch in the order in which they were laid (sounds like a business telephone answering service, doesn’t it?!). So chicks from the same clutch can actually vary up to about 21 days in their ages. The little guy in the box must have been the last in his clutch. Incubation is about 31 days. They don’t “build” nests, but find places to lay their eggs which they line with their pellets. Hunting. All owls’ eyesight is pretty superb — they hunt at night [see “Coyote Night Vision”]. But, the ability of Barn Owls to capture prey by sound is the best of any animal that has ever been tested. Their satellite-dish shaped faces helps with this. They eat mostly small mammals such as rats, mice, voles, gophers. Also bats. They don’t eat squirrels so much because they are less active at night. They also eat some song birds. 91% of barn owls, post-mortem, are found to contain rat poison. The most long-lived Barn Owl ever recorded was 15 years old. Poisons: Everyone, please don’t use poisons to eradicate rats, and please ask your neighbors to do the same. Rat poison is a horrible and slow death for rats, causing them to bleed from the inside out, and causing them to become disoriented and slow. This is why owls catch them. But worse, the poison actually travels up the food chain to these owls. Several years ago I sent in two dead barn owls for toxicity tests: they were found to have huge amounts of rat poisons laced throughout their bodies. We’ve also had a number of our Great Horned Owls killed by rat poisoning: One, this year, we guessed, was the mother of owlets who then never made it to adulthood. Coyote hurrying in my direction to keep away from dogs and walkers. It’s actually dark outside, about 9pm — it’s astonishing that my camera was able to register these clear, albeit blurry, images. I’ve known this coyote for seven and a half years — I’ve known him from before he was born. I can say this because I witnessed the entire courtship and pregnancy leading to his birth and knew he was on the way. He probably knows me as well as I know him. Coyotes are as curious about us and our dogs and probably spend more time watching us than vice-versa, and they are fast learners. I once read that, “Your dog knows you better than you know yourself. Why wouldn’t he? After all, he/she spends all his/her time watching you.” I thought, “well, of course!” Well, coyotes also spend time watching and getting to know us, our patterns of behavior, our attitudes and treatment of them. They are known for their curiosity and for observing. They are consummate hunters because they come to know the minute behaviors and reactions of their prey — they learn this by watching. For the most part, this fella treats me the same as he treats anyone else: he keeps his distance and is suspicious. Yet at the same time, we have an understood pact, born of years of experience: my pattern is to stand off and observe. I stay well out of the way so as not to be an element in the behaviors I observe, and I never purposefully engage his or any coyote’s attention or interact in any way. I have defended him against dogs and he understood my role during those occasions. He’s formed an assessed opinion of me based on all of my behaviors which are relevant to him over the last seven-plus years. But once I did break my rule to not interfere. A photographer with his dog was enticing/encouraging the coyote to approach them. The photographer and dog were on the path the coyote was trotting along. The coyote took a very wide detour around the man and dog to avoid them but then stopped to watch this duo staring at him. The man started taking photos and walking towards the coyote who now was within 50 feet. From years of observation, I could see that the coyote was turning to his defensive/messaging mode. If you, and especially if your dog, stares at a coyote, especially while approaching it, the coyote will become aware that he has become an *object of interest*, and the coyote may wonder why and what is going on. In a coyote’s world, *the interest* would be one of either predator/prey or possibly a territorial dispute. This man and his dog have continually been a little too *in-the-face* of this coyote which is probably why the coyote stopped when he was being stared at so intensely. I did not want the photographer to set up an antagonistic situation and then get a photo of the coyote messaging his dog, and it looked as though this was going to happen. The coyote would have *messaged* either by taking on fierce-looking body language as a warning or possibly even by nipping the dog’s haunches as a stronger warning. The photographer and his dog should have been moving on and away from the coyote — not towards it. So I interfered to prevent any engagement — and the possibility of such a negative photo — by clapping my hands and getting the coyote to move on. What is interesting — and this is the point I want to make in this posting — is the coyote’s total surprise at my unexpected behavior. The coyote didn’t seem to believe his eyes at first — this wasn’t one of the behaviors he had ever seen in me before. I could see that he was actually confused. The coyote look at me, frozen, in seeming-disbelief. I repeated my actions and the coyote backed away slowly, while looking at me quizzically. My behavior here was totally out of character. And I, too, felt that I had betrayed our understood contract, and I had. But that was better for the coyote than having him photographed in an antagonistic pose next to a dog by a man who was intent on publishing his photos — that would have been more negative publicity for our coyotes. This is an isolated instance of my interference and it hasn’t happened again with this coyote. I need to remain totally neutral always to get the natural behaviors I’m seeking. Another instance of a stunned reaction from this very same coyote was the time I walked my son’s dog. This coyote did an obvious double-take because I never before, during his lifetime, had been *with* a dog. This particular coyote, by the way, always flees the instant he ever sees the one and only woman who pursues him relentlessly and aggressively. The coyote has learned to avoid this one person because he knows she will engage in hostile behaviors towards him: she charges at him no matter how far off in the distance he is as he’s minding his own business, flinging rocks at him and screaming. 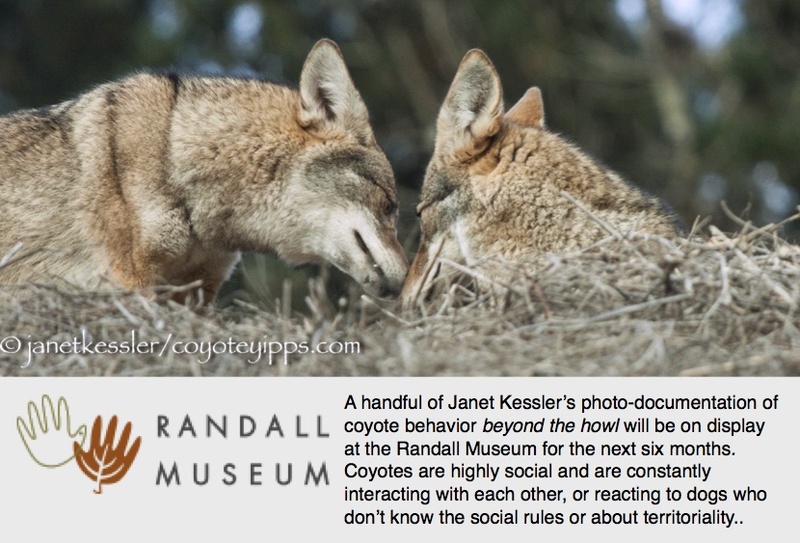 These little vignettes I’ve described here are to show how *in-tune* coyotes are to our behaviors — they do get to know us. As I said, this coyote treats me like anyone else: keeping his distance and maintaining his suspicions. BUT, he knows I will never pursue or hurt him, and in a pinch, I suppose he knows I’ll be the one who will be accommodating and will move aside to let him go by — this sort of routine has played out often between us. Back to the story behind the photos posted here. So today, when I saw the coyote trotting briskly in my direction and then look over his should at the two walkers and dogs coming towards him from behind, I realized that he was fleeing from the dogs and I was in his pathway. If he hadn’t known me and my patterns of behavior, he probably would have diverted off of the path to get away from both me and the dogs. Instead he hurried in my direction because he knew I was safe and that I would move for him. And indeed, I hurried down the path and away from him onto a cross path so that he could get by, and I then turned around to watch him and the developing situation. The coyote had come within 10 feet of me and, turned around to watch the dogs and their owners who were still approaching him. He peed/marked for them — actually a message of warning — as he watched them coming closer. He was aware that I was right there but he paid me no heed. Then he turned to continue on his trotting way, acknowledged me as he went, and I acknowledged him with, “Good day” and a nod, and he trotted on into the cover of bushes, with one last glance at those of us in back of him before disappearing from view. I reminded the dog walkers of the best way to keep his dog safe around coyotes: when you see a coyote, whether it is in the far distance, approaching, or at your side, always tighten the leash on your dog and walk away from the coyote without running. Before disappearing completely, the coyote turns and looks at those of us in back of him. He had gotten to where he wanted to go without incident. For the week of July 4th, The New Yorker “asked writers to describe a person, object, or experience that they think captures a distinctly American spirit.” I’ve reprinted several paragraphs here, of this New Yorker article, with a link to the original for continued reading. Illustration (by Oliver Munday) and text (by Ottessa Moshfegh)©The New Yorker, July 6, 2016. Enjoy! “The other day, I watched a wounded coyote jaunt down my street in East Hollywood. It limped suavely along the sidewalk at a confident clip, its mouth open in happy wonder or obscene hilarity—I couldn’t get a good read on him. Or maybe what I thought I saw in his eyes was just a projection of my own state of wonder at this gorgeous creature gliding coolly across my world of concrete and palm trees, elevating my humdrum hunt for a parking spot to a moment of amazement. I followed the coyote for a while in my car, then stopped to watch it step into busy Virgil Avenue, where it dodged cars so calmly, so expertly, that it almost appeared to be controlling the flow of traffic with its mind. Los Angeles coyotes live in the hills, in parks, in landfills, under highway overpasses. We hear them howl at night. They are indelible players in the theatre of the city, and frequent sightings remind us that this land itself is still a volatile and largely untamable frontier. A strange and dangerous paradise, L.A., and we stubborn fools insist on staying put despite earthquakes, drought, forest fires, the dwindling shoreline. I like living here because the illusory nature of reality is perversely obvious. Around every corner there’s another movie scene; a fictional shimmer rises up off the city through the smog. As a writer, my imagination feels freer here than in my native New England. There were coyotes back East, of course, but I like the peculiar grittiness and verve of L.A. coyotes. Their daytime presence in the city has increased with the drought. They come out in search of food and water. They don’t seem afraid of humans. Many humans, however, are afraid of them. In the suburbs especially, the fear is apparent: people arm themselves when they walk around at night. If a coyote comes onto your property, they say, shoot it on sight. Don’t leave your doors open. One step at a time, we’re getting the word out that social animals share many characteristics with humans. Outdated biases are often thoughtlessly — or purposefully — perpetuated in language, in this case, by using simple pronouns or designators which prevent folks from seeing social animals for who they really are. I sometimes wonder if referring to an animal as an inanimate “it” or reproductive entity such as “cow”, helps excuse and justify society’s treatment of them by keeping them at arms length: they are brutally hunted, brutally experimented upon, and brutally raised in preparation for the slaughterhouse. In the article: “Wild In The Streets: Pronouns On The Loose”, Huffington Post, June 17th of this year, Carl Safina, author of the wonderfully warm and biologically supported exposition, “Beyond Words” and author and host of “Saving the Ocean” on PBS, writes about our society’s use of impersonal pronouns when referring to animals, and how this detracts and diminishes them as sentient social beings. I, of course, totally agree with him. I’ve deliberately used “who”, “him”, “her”, “mom”, “dad”, to help folks better understand and relate to coyotes, specifically in my 2013 informational video presentations, “Coyotes As Neighbors” and “How To Shoo Off A Coyote”. I also wrote an article on the fallacies of the anthropomorphizing concept which simply diminishes animals and prevents us humans from getting to know them, rather than helping us understand them for who they really are: unique individuals with amazingly different personalities from each other. For The New York Times it was a bit of a watershed, straddling a furry area in pronoun policy and prompting an explanatory editorial. “Our goal,” wrote editor Philip B. Corbett, “is to reflect familiar usage among our readers. In the case of the cow in Queens, it seems our editors were caught between two impulses.” At The Times they are a-changin’. For a wonderful introduction and review of Carl’s book, Beyond Words, which will be republished in paperback on July 12th, see the following short YouTube video and read this review.